General interest meetings are held at the beginning of each semester for every club so prospective new members can determine if they want to join or not. GIMs are a great opportunity to learn more about clubs you are interested in before committing, especially if dues are involved. For example, you could go to the yoga club’s GIM to see if you like the instructor, how big the classes would be, whether equipment is provided, and ultimately whether you want to pay $30 in dues. Another benefit of going to GIMs is that there is often free food! Who doesn’t appreciate that? How do I find out about GIMs, you ask? Easy! Go to ccc.rochester.edu (CCC) and click on the “Events” tab to see all the events on campus that have been registered. Don’t want to see everything? Click on “Categories” on the left-hand side and select “General Interest Meetings.” Check CCC regularly because new events are added all the time! There are also posters around campus advertising GIMs, so you could look at common poster spots, including bulletin boards in residential halls (especially Sue B), Wilson Commons, and on the tunnel walls. However, this is not a surefire way to find out because not every club prints posters, and there are lots of posters up at any given time. So if you’re looking for a certain club’s GIM, you may not find one. 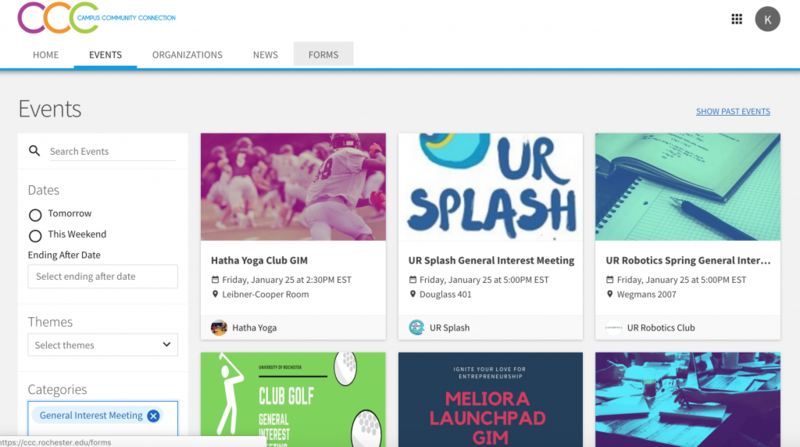 What if you missed the GIM for a club you’re interested in? No worries, just go to a club meeting. There will be fewer newbies and most likely no free food, but it will still help you decide if you want to join. Current members will still be happy to meet you and tell you about their club! What do you do after going to a GIM if you want to join the club? Join on CCC so you can get all the emails they send out about meetings, events, fundraising, and so forth. If you went to a GIM and the club wasn’t for you, you don’t need to do anything. However, if there was a sign-up sheet and you wrote down your email, you will be added to the mailing list. If you don’t intend to be a member, it’s best to remove yourself from that list in CCC. There are so many clubs and organizations to get involved in at Rochester. You’re sure to find something you enjoy!